I love tackling the “buzz” word muscles and topics. Piriformis fits into a category of muscle names that I hear so commonly. Other muscles and topics include psoas, QL (quadratus lumborum), sciatica and others. Piriformis is an important muscle, no doubt, and of course it is a “buzz” word for a reason. I think the most common reason people know about the piriformis muscle is because of its relationship to the sciatic nerve. It lies across and just superficial to this major nerve that feeds the back of each leg. The piriformis is one of six muscles in a group known as the deep 6 lateral or external rotators of the hip joint. Very few people seem to know the names of the other muscles in this group. So you can at least say that you’ve seen and heard of them, they are gemellus superior, gemellus inferior, obturator internus, obturator externus, and quadratus femoris. These six along with the gluteus minimus are the deepest layer of tissues in the buttocks. 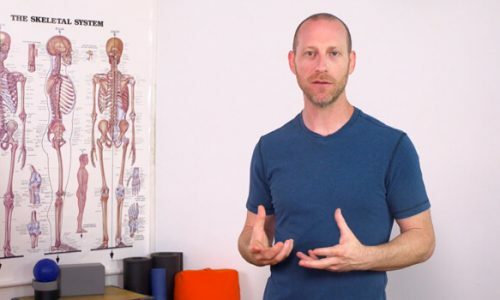 In my last newsletter I posted a video on lotus prep, which stretches these very tissues, piriformis included. The piriformis attaches on the inside (anterior) surface of the sacrum. You can see it below marked with the letter I. It then heads outward and forward (laterally and anteriorly) to its other attachment on the top of the greater trochanter. The piriformis is most commonly associated with the sciatic nerve. However, there is another very important and interesting relationship at work. The relationship I’m referring to is this muscle’s relationship to movement or stability at the SI (sacro-iliac) joint. You can read my post on nutation counter-nutation if you’re curious about the movements of the SI joint. Because of the piriformis attachment on the inside of the sacrum and its direction forward to attach onto the big bump at the top of the femur (greater trochanter), it creates a tensional force on the sacrum at the sacroiliac joint. This force is opposite of the force generated by the psoas muscle. The two therefore create a certain balance of forces at the SI joint. You can find more on the psoas at the psoas resource page. It’s for this reason that if one is experiencing SI joint pain, the tensional relationship between the psoas and the piriformis should be assessed. When I say assessed, I mean you could either create situations that test the flexibility/tension of these tissues, or better still is direct palpation (touch) of these tissues. This unfortunately assumes you have the skill to do that. You could also experiment with stretching both the psoas and the piriformis. Stretching the psoas requires extending the hip joint. A lunge can do the trick if the other hip flexors of the same side aren’t overly tight as well. “Piriformis Syndrome” is the real reason why this muscle can be a real pain in the… In this syndrome, the piriformis muscle (for a variety of reasons) is so tight that it places pressure on the sciatic nerve, creating pain, tingling, or numbness in the buttocks and down the back of the leg. These are of course the same symptoms found in “sciatica”. However, in the case of sciatica, these symptoms are actually coming from the spine. It is therefore helpful if one can differentiate between the two. As it turns out there is a very simple way of doing this. The accuracy of the test is good, but please don’t confuse this simple test with being a doctor and producing a diagnosis. Use the results as information and continue to proceed with caution if you or a student wants to try and differentiate between the two. The simple test to differentiate between sciatica coming from the spine, possibly disc compression, and the piriformis compressing the sciatic nerve, is this: Lie on your back. Lift the leg of the affected side. If the leg is able to lift higher than a foot off the ground there is a good chance that it is piriformis that is tight. If one lifts the leg and within six inches has shooting pain down the back of the leg, it’s more likely to be coming from the nerve being compressed closer to the spine. I cover more on the potential reasons that piriformis could contribute to pain in the body on pages 117-118 of my book (1st ed.) Functional Anatomy of Yoga. 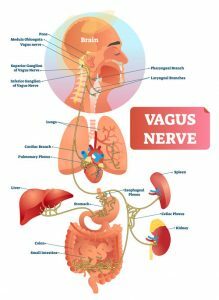 Your nerves stretch along with your myofascia (muscles and connective tissues). 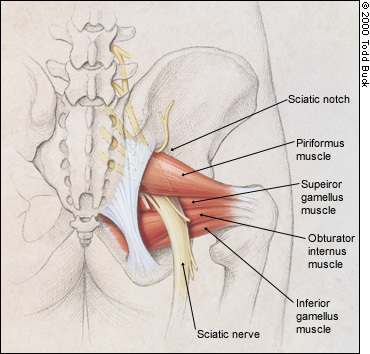 The positioning and nature of the piriformis will allow the sciatic nerve to stretch more or less uninhibited. If the compression is from a disc or even vertebrae at the spine, it’s generally less forgiving. As the nerve is stretched while being compressed by either of these structures, it will send a shooting sensation down the back of the leg. Again, this is for information gathering rather than making a positive diagnosis of your own or someone else’s pain. There’s another sneaky problem that can mirror a similar pain pattern. Trigger points in the gluteus minimus muscle can create a similar kind of pain pattern in the buttocks and down the leg. In this case, the pain is often described differently. The person will also have pain in the buttocks and down the back of the leg but it will generally be more like a dull achiness, or a weak feeling in the leg. Occasionally though it will be described as a shooting type of pain. Sitting for long periods of time also often aggravates trigger points in this muscle. I’ve even had a few students who complain about a hamstring tear and sit bone pain who found upon further inspection that it was a trigger point in the gluteus minimus muscle creating the pain. Even the piriformis itself can generate trigger points that can be misdiagnosed. See image below. a couple of months ago i pulled ‘something’ in my poserior thigh region i think during Supta Kumasana. At the time I didn’t think too much of it. However I now experience a dull throb alot of the time which basically only subsides when I’m lay on my front. The pain can become more acute during certain asanas and driving. I had thought I may have slightly torn a hamstring as it is particularly problematic and prohibitive during straight leg poses. Then this week my teacher said she felt it sounded like the sciatic nerve and it is likely my sacrum is not moving freely. She did some sacrocranial work on me and the pain does seem to have become less acute and spread over a wider area including my lower back and right buttock. The tightness in straight legged positions and standing forward bends remains. Sitting for anything over 10 minutes and the dull throb emerges and gets gradually worse. What seems most likely to be causing the pain and tightness to you? 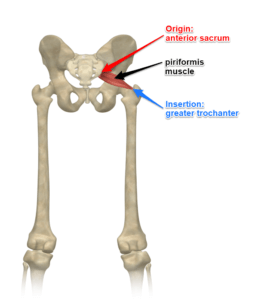 The hamstring, Sacrum or piriformis? What can i do to help it? 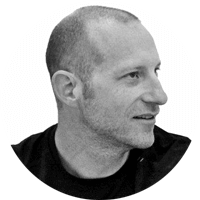 The hamstrings, piriformis, sacrum and I’ll add one, the gluteals… especially gluteus minimus and medius could be culprits in creating your pain pattern. The more complicated answer is that all of them are probably occurring simultaneously. For instance, it may have begun as a hamstring tear and because of the change in tension, other muscles have contracted to stabilize the area. It’s also possible that the sacrum has shifted out of place as a result of tension in the hamstring or gluteals. Which is most likely? I would have to be there and touch and poke on each one to see which is most sensitive and tense. I’m going to guess that you should do two things… and if you choose to do them, please use common sense to adapt to sensations and yourself as I’m not there to adapt it for you. Second… can I suggest you get a body rolling ball, or a tennis ball and lie on your side, and put it right under your hip on the side that you have pain… move around a bit and look for sore spots. You could also look up a good therapist and ask them to check your gluteus minimus and medius for trigger points. Thanks David! My Hubby has been having sciatica trouble for a while now – this will help for sure! One question, though – he does do these stretches, but pigeon pose is really uncomfortable. Should he hold off on that one until the fire logs stretch is a little less intense, and then try again? Thanks again! In short, yes, do the less intense one first and as I suggested above to Ruby… Get some body rolling balls and make him roll around on his hips and see if you can undo some tension that way as well as with the stretching. Hi David, From your explanation it seems that I call in the category of piriformis syndrome. However I have too much mobility in my left SI joint (the same side where the piriformis is tight) and I find that stretching the piriformis further destabilises this joint. I have stopped pigeon, and rolling over spikey ball. I now have more stability but a very tight piriformis. Piriformis syndrome normally shows itself as pain in the buttocks and down the leg as in sciatica. I definitely agree with the idea that if stretching the piriformis muscle destabilizes the joint further, you should stop stretching it. I think the right question for the moment is why is the piriformis tight in the first place? There are a number of reasons this can happen. Because we know you have SI joint problems, I would suggest that we look to the psoas on that side as well because both the piriformis and the psoas of the same side help balance the SI joint. It may be that the psoas on that side is tight and pulling the sacrum in one direction and the piriformis is having to fight against it (in a sense) and therefore is showing up as tight. This is of course just a starting point and a guess as I’m not there to check it on you myself and see what I find. Perhaps it makes sense or helps you as you try to figure it out. I just checked back to see which side the pain was in! As I now have a similar pain in my left leg and wasnt sure if it was the same ongoing injury. Its not! Keeping my legs straight definately helped. Funny how my legs always seem to be playing good cop bad cop! But confident the right glut pain is gone and therefore injury healed and not pirifomis I am hopeful this years left glut pain and injury will also heal and not be some anatomical piriformis problem I cant get round. Thanks for your advice – It worked. Thank you so much for the article! I have recently developed an odd sense of almost cramping deep inside of my left hip during Prasarita Padottanasa. It is kind of a dull sensation, but it is getting worse and now I notice a dull ache when sitting in the car etc. Then yesterday while in class we did some kind of stretch where we cradled our leg like a baby rocking side to side (left knee in the left elbow and right foot in right elbow) . Then we leaned over to rest the left elbow on the ground, OMG! The entire hip area was so sore! Does this sound like the beginning of Piriformis Syndrome? I have dull or throbbing pain that seems indicative of a piriformis problem. My pain radiates to the front and outside of the thigh though. Sometimes my hip feels like it pops out when doing abducting exercises. Could you comment? My guess is that you have an active trigger point in your gluteus minimus. That is, of course without seeing you. Check out the Sit Bone Pain Articles here and here and you should find some links to trigger point images. You’ll want to find a therapist who is familiar with treating them as the it’s probably not just trigger points but excess tension causing that feeling of the joint slipping. When I had this pain I backed off on the yoga and looked for an acupuncturist ( my local one is great…)but, I was out of town. So, I took a chance on someone else who practiced differently than I was used to.She used heated needles and electrical stimulation. I did not feel comfortable with the thought of the procedure but took a chance….I didn’t feel anything for an hour and then pain developed in both cheeks. Yahweh! My sister took me to her chiropractor who said that my pelvis was unbalanced( duh, I have scoliosis…. )he gave me an adjustment. Pain still persisted….Few days later, I started doing trigger point massage from Davis book and did a jacuzzi for a few days,directing the jets to those areas , went to bed with thermaguard heat patches.It went away!!! I try to add therapy balls( Jill Millers) to my yoga practice before or after and have been working on adductor/abductors strenghtening/stretching. I’ll never forget that experience! Thanks for sharing. You never know what’s going to work. I’m so glad to hear that you didn’t get stuck in your process! I experience the movement of a string or tendon over a bone sensation quite frequently and I am trying to figure out where it is coming from and how to prevent it. Any thoughts on what that is as well? I have heard of a similar sensation in my students quite often. They generally report it moving into pigeon or lounge lunge. I’ve never considered it an issue since it was never painful until now. Did you read these articles? Yes I did..I am still having trouble navigating the origin of what is going on. With my previous hamstring injury I never had any pain sitting like this. I can’t help but think the issue is a little more complicated than I can figure out. I’m not sure why the links didn’t post… Here is a link to the site search, make sure to read the top few articles. A few months ago I began experiencing pain pain in what I am guessing is the piriformis on the right side. Sitting in lotus or half lotus seemed to aggravate it, as did stretches like pigeon and your lotus preparation poses. What does this mean? Is my psoas too tight? Also, I have noticed that when I touch the base of my tailbone, it feels like it is pointing slightly to the right side. And, When I sit up from lying on my back, it feels like my femur on the right side pops into the joint a moment after the left joint has smoothly made the motion. Any idea what’s going on here? Thanks so much. It sounds like you need a good assessment or evaluation to figure out what specifically is going on with you. Just because something hurts doesn’t mean it needs to be stretched. If pigeon type postures aggravate it, then, not for you at this moment. Unfortunately, I can’t figure this out what is going on for your specifically through comments. I would need to see you and work with you for a bit to help you figure it out.